Cumberland County ACTION of PA presents a discussion on “Faith in Government and Politics”: Two Pennsylvania Supreme Court Republican Primary Candidates, Superior Court Judge Cheryl Allen and Montour County District Attorney Rebecca Warren, both professing Christians who a desire to uphold biblical principles in government, will discuss the importance of their faith in their careers and how they reconcile it with their public office. The two candidates will also discuss the political process of electing judges and the role of the judiciary in state government. The candidates will be prepared to answer your questions after their presentations. This portends to be not only an informative event but a thought-provoking one as well. Soup and sandwiches will be available at the beginning of the event; we shall accept donations. Please bring a friend. The Pennsylvania municipal primary election is scheduled to take place on Tuesday, May 19th. For information about Cumberland County ACTION of PA, CLICK HERE. Lighthouse Baptist Church hosts their 2015 Spring Bible Conference with the theme: With God All Things Are Possible. Please take a few minutes to provide feedback on the recent Forum on Theological, Legal, and Practical Issues Affecting Churches Today. 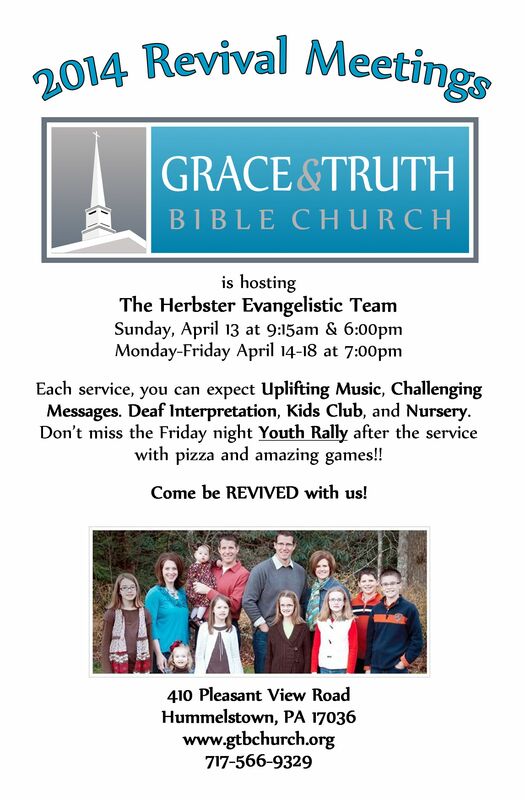 Grace and Truth Bible Church of Hummelstown invites you to a week of revival meetings with the Herbster Evangelistic Team beginning on Sunday, April 13 until Friday, April 18. For more information about the meetings CLICK HERE FOR A BULLETIN INSERT or click on the church name or picture anywhere in this post.